Well I’m sure you’re just dying to read all about our weekend after that post title, huh? Riveting. Haha. Our weekend was a much needed weekend to do not much of anything… No commitments, no major projects, nowhere to be except for church on Saturday evening and our usual family lunch and dinner on Sunday. It was really nice. Friday evening started out with a bang when Jacob brought home his very first test from school… he had a spelling test for his first two red letters – a and is – and he got them both correct! I’m such a proud momma! Saturday was glorious. It consisted of baking Chocolate Chip Banana Muffins for breakfast, coloring with the babies, playing, and working on getting the kids’ baby books caught up. I got to spend lots of quality time with each child and the kids got along so well when they were playing on their own. 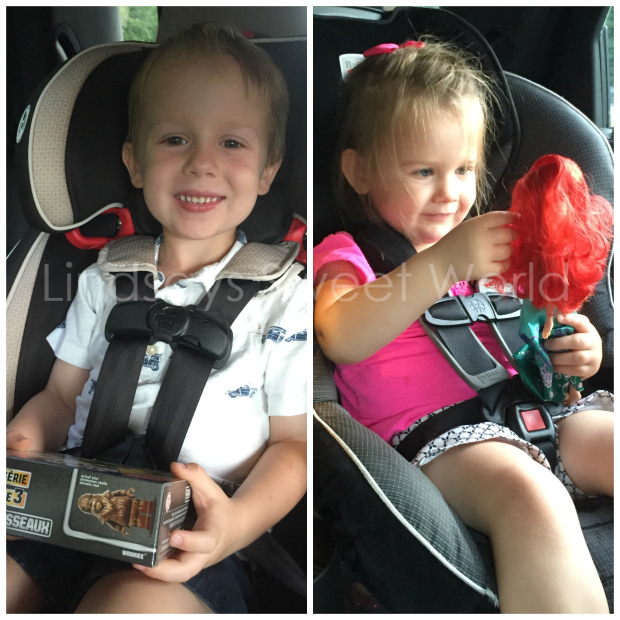 Saturday evening we went to church and both kids were extremely well-behaved. Jacob slept through the first half which was crazy because he never naps, and Olivia sat nicely in the pew reading her little bible. Both got a little squirrelly toward the end, but that’s to be expected. An hour is a long time to ask small children to be totally still and quiet. After church we went out with my parents, grandmother, and aunt and uncle to one of our favorite pubs for dinner and drinks. At the end of dinner, my aunt busted out the “Snapchap” as Olivia calls it and everyone had fun cracking up over the filters. I mean, seriously, they must stop with the creepy filters. These pics of Jacob are absolutely terrifying. Lol. When we got back home, there was a beautiful package sitting on the front porch and it was addressed to me. 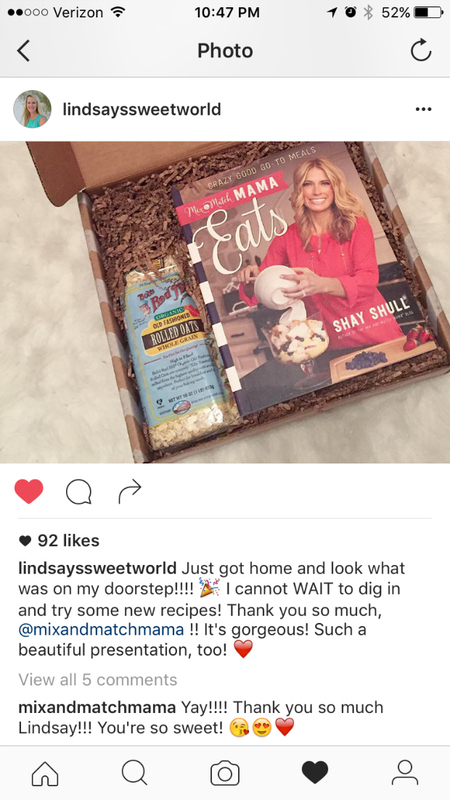 I couldn’t for the life of me figure out what it was, so I tore into it and was so excited to see Shay Shull’s (Mix and Match Mama) new cookbook nestled in the box. I knew it was coming as Shay had emailed me last week to ask if I wanted an advanced copy, but I wasn’t expecting it to arrive so quickly. It was the perfect Saturday evening treat! I spent the rest of the evening watching FNL and flipping through it, and there are some excellent new recipes to try. I’ve already marked a couple to try this week! Shay liked and commented on my picture! I mean, seriously! I’m totally fangirling over here. DYING, you guys!!!! DYING! Shay is just the sweetest and she has always been one of my favorite bloggers… hers was one of the very first blogs I ever started reading on a regular basis, so when she emailed me last week to ask if I wanted an advanced copy, that was a no-brainer. Yes! The answer is always yes! The new book will be released October 1 if you want to check it out. And no, she didn’t ask me to promote the book. I just love her and I make her recipes all the time, so I’m completely honored to have received a copy already and I wanted to share that goodness with all of you sweet ladies, too! Sunday morning we had leftover Chocolate Chip Banana Muffins, did some laundry, and the kids destroyed my lovely made up bed while we got ready to go to lunch. We spent the afternoon at my in-laws’ eating a delicious lunch that they had prepared and playing card games with my nephews. They both learned to play “Speed” recently, and that brought back soooo many memories from junior high… do y’all remember that game?! It’s one of the best card games ever. Sunday evening we celebrated my Grandma’s birthday at my parents’ house where we feasted on BBQ chicken, mashed potatoes, green beans, and a new recipe for cauliflower cakes that my mom found. OMG they were good. I’ll have to share them some time! I hope you all had wonderful weekends with the ones you love and I hope it gave you a fresh start to the new week! That's so awesome you got a copy of Shay's cookbook! I would totally be fangirling, too. 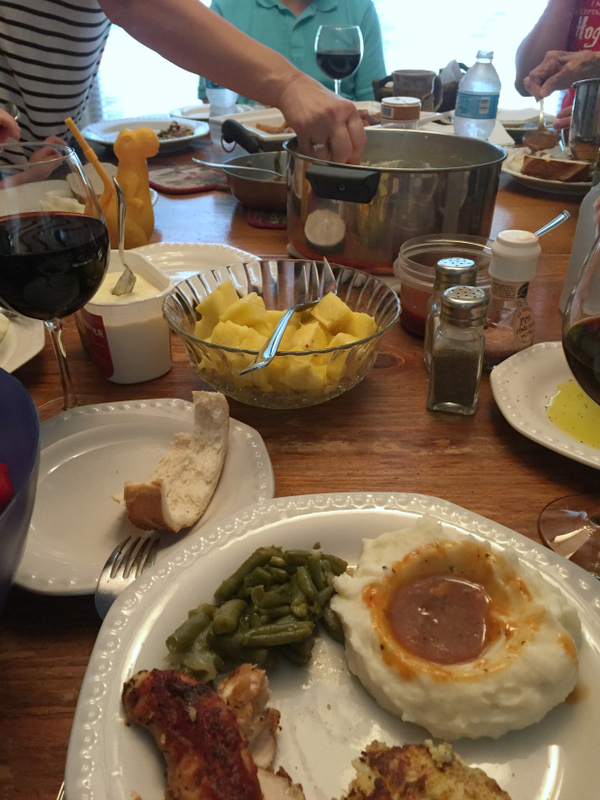 Sounds like you had a lovely weekend - those mashed potatoes and gravy looks AMAZING. What a great weekend! 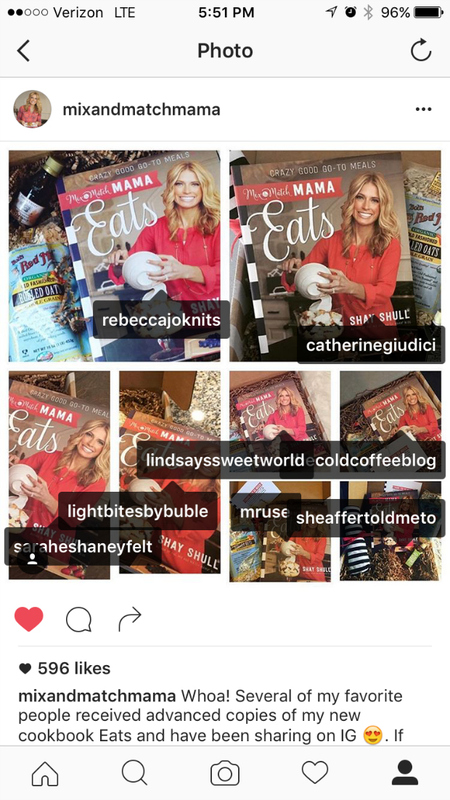 I have Shay's cookbook on my Christmas list!! I would have totally fangirled too. No shame in the game. :) I want to come to Sunday dinner with you. Yum! Wasn't getting that package so much fun?! I marked a few recipes in mine, too! You weren't the only one fangirling. ;) Your dinner on Sunday night looks fabulous! I love mashed potatoes. I have no idea who Shay is but now I totally feel like I need to check her out. That is so cool that she commented on your photo. It really is the little things. Looks like the perfect weekend. I need one like that, maybe this week! Yay for a low key, yet exciting weekend! Look at Jacob and his first test! What a smart little cookie!!! I'm so excited for you having Shay Shull not only like and comment on your IG, but also thank you on a personal, first name level!!! What what?!?!? So cool, girl!!!! I love those kind of weekends. I hope your week is as awesome! I'm still dying over you getting an advanced copy!! So so cool!!! I adore Shay and her blog! I must own this book once it comes out! I would fangirl like crazy too! That is so cool that you got an advanced copy!! I too would be totally fangirling!! Sounds like it was a fab weekend. Olivia's chambray top is too cute. Sounds like a great weekend. Love that you got her cookbook. So awesome!! I can't wait to read it when it comes out. 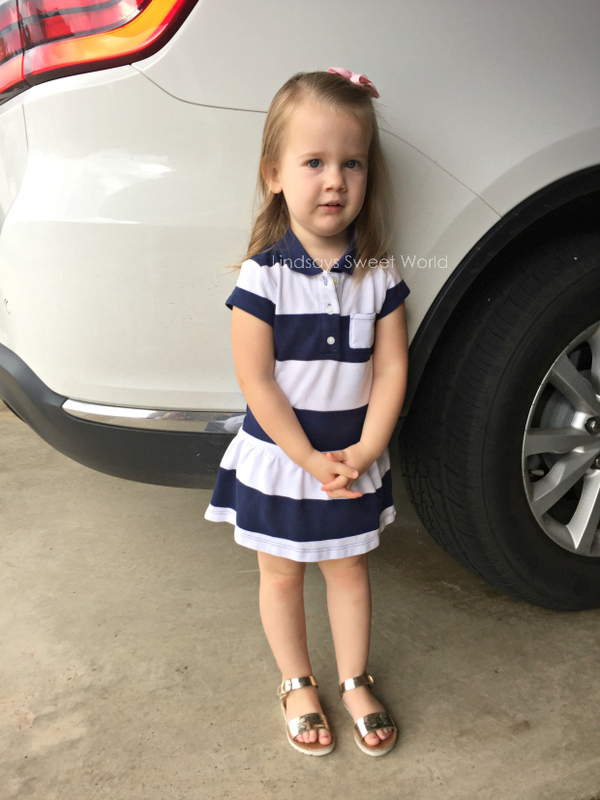 Loving Olivia's new clothes! Yay for the new book! That is so amazing! I just love her blog and reading all about her recipes, how she comes up with them, I have no idea! What a great weekend, and my daughter is obsessed with Ariel! I think she must have at least 4 Ariel dolls. I think your version of a nothing to do weekend is very different than mine! haha you crammed a lot in there. That cookbook looks so great too, cant wait to see what your favorite recipes are. I love weekends with no plans. They're the best and are really too few and far between! Yes for FNL - so, so good. Enjoy! Yes they are, girl! Yes they are! It was our last weekend to do nothing probably until after Christmas because we have birthday parties galore this weekend and then after that it's football, and aaaallll the holidays! I need to get me a coloring book... I feel like I could totally get behind that! !